You want your employees to be warm and comfortable to be able to their jobs as comfortably as possible, especially during the chilly winter months. Whether you have a warehouse, a construction job site, a garage, or a cold factory floor, we can help. More, infrared heaters are cost effective, using up to 70% less energy than traditional forced air heaters. With proper, annual maintenance, which can be done by our team of experts, you'll enjoy years of smooth, efficient heating! The GN5/GP5 is the newest model produced for the Val6 series. It incorporates a gas burner into our infrared heater technology as it utilizes a premixed combustion burner that creates a blue flame due to premixing the fuel gas and air in advance. This means virtually silent operation and clean combustion. Featuring 51,200 BTU/hr, a high-pressure spray burner, 120V/60 Hz, photocell flame monitor, fuse overheat prevention system that prevents system tip-over, and no odor or smoke while running. 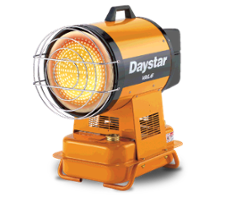 Featuring 111,000 BTU/hr, 0.85 gallons per hour nozzle, 120v/60 Hz, photocell flame monitor, tilts upwards 20 degrees, and no odor or smoke while running. Featuring 111,000 BTU/hr, 0.85 gallons per hour nozzle, 120V/60 Hz, photocell flame monitor, 3A, tilts upwards 20 degrees, and no odor or smoke while running. Contact Us for Infrared Heater Sales, Service, or Maintenance!